Miniature Schnauzer, You got a treat? Max came to us just before Christmas in 2006 to join my husband, our 4 year old black schnauzer named Gus and me. He came all dirty, stinky and matted and was 3 months old. He is the most loving and spunky little guy. We lost my husband 2 years ago and we lost Gus 3 months ago and he has become such a wonderful and loving support. He loves to walk, chase squirrels and birds and play tug of war. 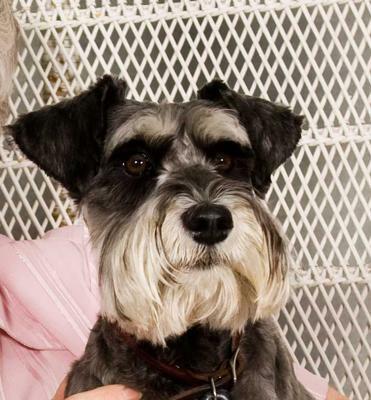 That is a very handsome Schnauzer. You have my heart felt condolences on losing your husband. I lost my husband to cancer 3/08. I also lost my little 16 year old Schnauzer, Mieka, three months before my husband passed away. Two weeks after becoming a widow, I was looking at petfinder.com and saw a mini at a local shelter. She was there as a biter and looked so afraid. I went to see her and took her on a three day trial. Her name is Daisy Duke and she has been a God Send to me. She is loving, funny, loyal, and a great little protector. She plays great with kids and adults. She has a forever home with me. Congratulations to you Max Elliot! What a very handsome fella you are... enjoy your reighning month. 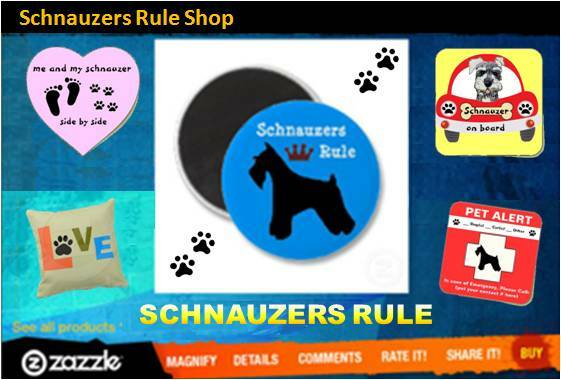 What a handsome guy you are...congratulations on winning Schnauzer of the month! Congrats Max! You are a handsome guy. I know you're bringing a lot of comfort and joy to your mom. Enjoy the extra treats and belly rubs you're going to get for being a celebrity!!! Return to Schnauzer Contest Photos.